With a handful of flashlights available in the market nowadays, you can find yourself trapped between choices and options. There can be several factors that you need to consider – questions such as how much you will be willing to spend for it, what type of flashlight you will need and also the specific features that you would want to come with it. If you do not have even the slightest ideas, go and search or ask for flashlights that are highly popular, or should you say those that are considered the bestsellers in this particular category. In this light, perhaps this review of the Helotex XG1 90 Lumen AAA Flashlight might just be a timely read. Helotex has been around since 2011, originally from the brand Gun Shack LLC which is a gun shop located in Helotes, Texas (thus the name Helotex, obviously.) Being a gun shop, they decided to expand their venture and provide a brand of flashlights that can be a good value for their customers’ money. Among their popular lines of flashlights would be the Helotex XG1 90 Lumen AAA Flashlight . Featuring CREE XP-E LED, the Helotex XG1 can reliably produce an output of 90 lumens. The flashlight runs on AAA battery that is convenient enough for you to use it as needed, as long as the source of power is available. The flashlight also comes in black color, making this equipment appear sleek and classy despite the affordable price. Weighing only about 0.3 ounces, it is indeed a lightweight gear that you can carry around whenever and wherever you feel like it. The product dimensions are pocket-friendly, as its small size can conveniently fit into your pockets or belt bags as breezy as your mobile phone would. As already mentioned, the Helotex XG1 has an output of 90 lumens in LED light. On the rear of this flashlight you will find an on and off button on tactile click. You are assured that it can withstand any weather situation or outdoor setting with its anodized 6063-T6 Aircraft Aluminum – which is quite a steal if you are to consider the amount that you are paying for this flashlight. Aside from the detailed construction, it also features o-ring seals on every part, again for weather resistance purposes. Its CREE XP-E LED bulb has a 50,000 lifespan and you can expect the battery life to last for up to an hour. Though the flashlight only has one mode – the High mode, you can expect maximum performance which is very ideal if you are looking for a reliable flashlight for daily use. There is also a sturdy built-in belt clip that can greatly help in holding the item securely in your pocket. You can also easily remove this clip in case you do not want to retain it. If you will try searching for the Helotex XG1 90 Lumen AAA Flashlight on Amazon, you will immediately notice how the reviews are generally more on the positive side. This is surely the main reason why this flashlight belongs to the popular products in this category, especially when you are to consider the price. One customer review details just how bright the light is, despite its compact size. Another review focused on how powerful the Helotex XG1 is, considering the fact that it only runs on one AAA battery. With only two modes available, it is also simpler and easier to use. Perhaps that is enough reason for the flashlight to not have an instruction manual with it as you open the package. It is a much-needed timeout from those other flashlights that are too complicated and hard to operate at first. Most consumers would buy a flashlight and other tactical gears for emergency purposes and other similar reasons, and not to show it off or something, so it is quite relevant and appropriate to choose a product that is easy to use and economical too. There really is no hard rule when it comes to choosing the best tactical flashlight. How to pick one would only boil down to knowing what kind of features do you really need. If budget is not a problem, well and good, but if you are looking for something that is not only efficient but at the same time affordable, too, then the Helotex XG1 90 Lumen AAA Flashlight will surely make a good purchase. Not only this flashlight is reasonably-priced, it is also very reliable, powerful and lightweight, as well. If you are looking for a flashlight that you can carry around every day, may it be for your work or just for something that you can use as you roam around your backyard at night, then this product is worth a second glance. As the latest addition to the family of Helotex flashlights, the K1 is among the world’s tiniest AAA flashlight available in the market. 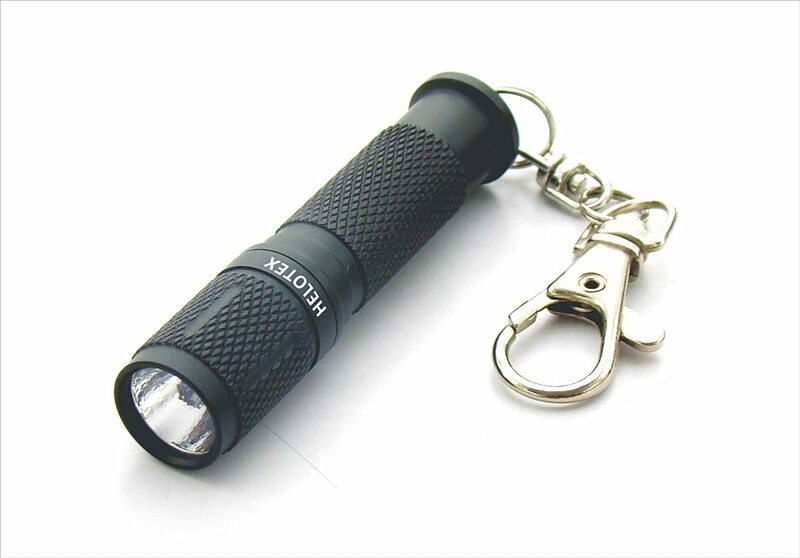 Measuring only 2.5 inches, it is suitable as a keychain flashlight. Plus, it barely adds to the weight of your keys at 0.3 ounces, making it perfect to carry around on your keychain. The Helotex K1 features the CREE XP-E LED for an impressive output of 90 lumen. It is recognized as the brightest flashlight among flashlights of its size; however it does not give a blinding effect after you turn it off. The flood on this light is wide when it is 10 feet out. According to a verified customer, the light was able to illuminate a large part of a 30 foot wall at about 10 feet away, including the floor and ceiling. You may notice a thin rim of light or halo effect in the reflector with a tiny gap just before the rest of the flood. For most people this is a non issue but it may be for some. The Helotex K1 is a candidate for being one of the best tactical flashlights in the market, featuring a twist on/off head, key chain and a pocket clip. You turn the light on and off by twisting its head; it can be a little stiff which is a good thing because it won’t easily turn on when banging keys or things in your bag or pocket and that cause the battery to drain faster. The handle clip can be used to attach the light to your key chain or belt loop. Although, some prefer the reversible clip so they can slide it on their baseball cap and use it hands-free. Additionally, the key chain is a latch style which is easier to attach and take off keys in case you want to use the light and keys differently. This tiny AAA flashlight is built with anodized 6063-T6 Aircraft aluminum and has a very good finish that gives you a good and comfortable grip. It does not feel rough or scratchy and its head is smooth to twist and does not move around if you want the light to swing loosely or whit it around. The head is a good size for an easy grip as well as the body which is really sturdy. For maximum weather resistance, this light comes with an O-ring seal. The Helotex K1 runs with only one AAA battery which is more practical than the button cell batteries which most key chain flashlights use. Being just as big as an AAA battery, this light is ideal for people who want a tiny flashlight that they can attach to a backpack. This flashlight can be very useful for instances like dropping your phone in a dark parking lot or when you misplaced something in a dark car or even when you have to pass by a dark passage way. This tiny flashlight can be your lightweight safety buddy. It produces a bright light considering the size and battery capacity of this light. If you are in the search for a portable, compact and EDC flashlight that is not so expensive, the Helotex K1 is a good choice. We have spotted this flashlight online and comes with a 1 year limited warranty. The original list price, which is also the price in the Helotex site, is around the medium price range for a tactical flashlight. This flashlight have earned a rating of 4.6/5.0 stars by our team. If we base its credibility on these stats, then we must say that the Helotex K1 is a great buy. The Helotex K1 is one of the brightest small sized flashlights. With its pretty tough built, it gives you a long life of use. There may be comparable models out there, but this one has proven its worth with a 4.6/5.0 rating by our team. You may expect a small flashlight because it is called a key chain flashlight, but you will be surprised of how small this light is. The light is also a good choice for gift this season. This wonderful tool is just one of the many available items in the market. To help you sort out your choices, we have come up with our best tactical flashlight review. This should make your decision making easier. For a 4-inch flashlight, the Helotex VG1 CREE LED is one bright flashlight. This mini flashlight can illuminate tree tops from a distance and brightens everything surprisingly well. Its light is bright white light and not the yellowed light like what you find in most cheap lights. It also has a clip where you can use to slide the flashlight on the brim of your hat. The clip is very tight which makes the flashlight secured; however it can be difficult to clip it on and off and may hurt your finger. Helotex introduced the VG1 to allow first time customers to experience the quality of their products. They intended to keep the price down so they chose the CREE XP-E2 and incorporated a commercial off-the-shelf LED driver circuit. They also added a convex lens with an adjustable zoom as per customer’s request. CREE is a dependable brand that is based in Hong Kong. Their LED lights have been acquired by companies like Helotex because of quality and performance. Featuring a CREE XP-E2 LED, the Helotex VG1 can produce an output of up to 120 lumens and has an adjustable beam. The flashlight presents a tactile click button for on/off, located on the rear of the flashlight. The flashlight features three modes; High beam, Low beam and Flashing beam (strobe function), which can be toggled by tapping the on/off button. The flashlight also has this convex lens where you can zoom to widen the beam or narrow down to a square spot beam. It comes with an instruction manual for users to read on. Built with anodized 6063-T6 Aircraft aluminum, the Helotex VG1 feels solid and does not feel like some lightweight toy. The surface of the handle is also textured for added grip comfort. It is also equipped with o-ring seals for optimal weather resistance. A customers have purposely drop tested the Helotex VG1 on a carpeted surface, grass, dirt and on concrete (5x) and have proven its dependability. Everything was still functioning properly except for some nicks on the outer shell. The Helotex VG1 led flashlight runs on a single AA battery that can last up to 2 hours, which makes it a practical and economical choice. It is amazing how bright this light can be with just using one battery. Customers tried it with lithium, rechargeable and cheaper brand of battery and it worked just fine. There’s no noticeable difference of its functionality and the flashlight’s performance is the same on each battery, so no need to buy expensive batteries to get optimum power from this flashlight. Compact, small size means you can carry it around on your pocket or insert on your tool box or car compartments. The Helotex VG1 flashlight is originally sold at the lower end of the tactical flashlight market but is now available for a discount at many online stores. Considering what you can get from this flashlight, the price is a bargain. You can use this light for various situations and environment. You can use it indoor or outdoor, ideal for traveling; put it inside your car for emergencies like checking your engine when it’s dark and also you can add it to your survival kit. It is also perfect for cycling, camping, hunting and other outdoor activities. With an outstanding 4.9/5.0 rating by us, the Helotex VG1 flashlight is unquestionably one of the best mini flashlights in the market. With an affordable price, this little light packs a lot of punch for a very cheap price. The best thing about it is the strong clip that you can attach to your belt or hat. If you like to use a flashlight hands-free, then this is a perfect choice. Another great feature is the sturdy design and industrial feel, which can actually undertake falls even on concrete grounds. Customers have not mentioned anything that they don’t like about the Helotex VG1 CREE LED flashlight. It’s definitely a great buy! The Helotex G2 Tactical Flashlight is a small-sized LED flashlight has earned a 4 out of 5 star rating by us. Priced originally at at the lower end of the tactical flashlight market and is now available for even more discounted price at online stores. This flashlight is lightweight at 2.4 ounces, which makes it absolutely ideal for people looking for a perfect everyday-carry flashlight with efficient light output. Recommended for the following use: House / Car / Tool light, Defense light, pocket light for unarmed Security personnel, Rifle / Shotgun / Pistol light for home defense, back up tactical light for Law enforcers and armed security officers. The Helotex G2 is coated in an anodized 6063-T6 high grade Aircraft Aluminum casing and features toric joint seals on all sides to ensure that the unit is shock and water resistant. The flashlight features a CREE XR-E Q4 LED which produces an incredible output of 130 lumens with three light functions: High, Low and strobe. The mode will always revert back to its default function -high mode – whenever the flashlight is turned off. The unit has a tangible on/off click button on the bottom part of the unit. It includes a tailcap switch that’s set back to the rear part of the unit so the flashlight can tail-stand. 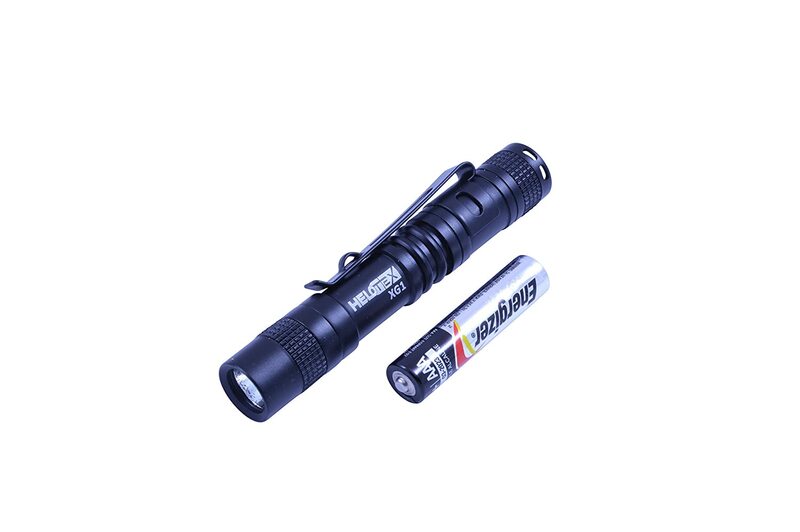 You have the option to use one AA battery or two CR123 to run Helotex G2 Tactical Flashlight. AA battery will produce a maximum of 120 lumens while two CR123 will produce a maximum of 130 lumens. The preference of battery also matter in terms of this flashlight’s size; using a single AA will give you 4.2 inches sized flashlight while using CR123 batteries will give you a 3.6 inches flashlight. You can convert from AA to CR123 by removing the middle chamber. Cells of both batteries hold securely and does not bounce around inside. The flashlight has a runtime of an hour with a single AA battery and two hours with two CR123 batteries. The Helotex G2 Tactical flashlight’s size makes it a good tool to bring with you all the time, it can easily fit into a pocket and feels good in your hands. However, the option of using CR123 batteries will shorten the length of the flashlight so it might feel small in larger hands and might be hard for some users to reach the switch. Most users use AA batteries though as it is commonly available in the market than the former. With its checkered texture, Helotex G2 is easy to hold and feels sturdy for its size. You don’t want to drop it in a hard surface though for it is not fully shock resistant or you’ll end up with a damaged flashlight. On the other hand, this flashlight is sealed with O-rings for water resistance. Also you can observe the removable clip is facing the rear part of the light making it possible to clip to your headlamp or baseball cap if needed. Most flashlights have the clip attached facing the head part making it only useful for carrying around. For the low and affordable price, Helotex G2 tactical flashlight is a great tool for the money and is well built like those of the expensive lights. The high setting is more than adequately bright that it can blind a person when flashlight is directly pointed on face and the low setting is great when you don’t need to light up the whole room or for firefighters who don’t want to blind their fellow firefighter when clipped in their helmet. Low setting also offers better battery life. 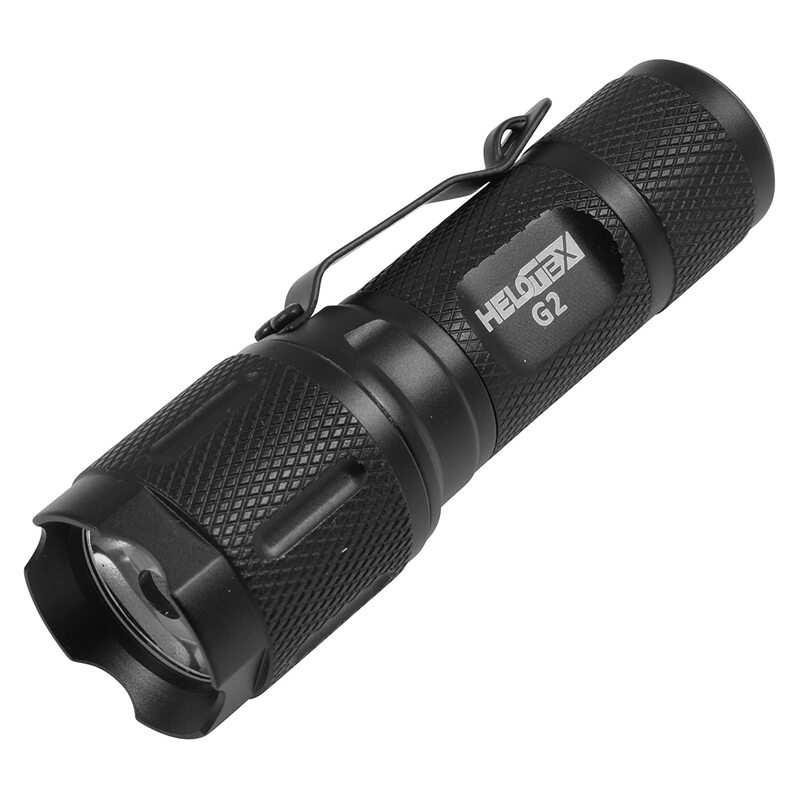 If you are searching for an affordable, portable, easy to assemble and dismantle tactical flashlight for everyday use, then Helotex G2 is an ideal option. It can be powered by a single AA or two CR123 batteries and can yield maximum light output of 130 lumens. Comes with a tactical on/off button for effortless operation and three modes (high, low, strobe) that can be easily toggled by just pressing the on/off switch. The flashlight has a sturdy construction with O-rings for optimum weather resistance. This one is definitely a must-have. A compact, small size flashlight that perfectly fits most hand sizes and can also fit pockets.